Afghanistan has pledged to step up its fight against corruption in return for international support after foreign forces withdraw in 2014. 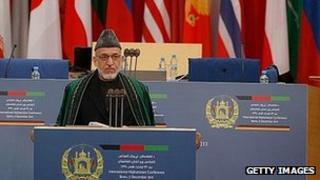 The promise came at the end of a one-day global conference in the German city of Bonn on Afghanistan's future. The closing communique said "substantial progress" had been made since the last conference 10 years ago, weeks after the Taliban was toppled. However, key player Pakistan has boycotted the talks. Islamabad has been angered by a Nato attack on a border checkpoint last month that killed 24 of its soldiers. The final communique said that the international community was ready to stand by Afghanistan in the 10 years after Nato's withdraw - in exchange for good governance. "The protection of civilians, strengthening the rule of law and the fight against corruption in all its forms remain key priorities," the document read. "Al-Qaeda has been disrupted and Afghanistan's national security institutions are increasingly able to assume responsibility for a secure and independent Afghanistan," it says. However, it added that "shortcomings must be addressed" with the goal of creating a peaceful Afghanistan "in which international terrorism does not again find sanctuary and that can assume its rightful place among sovereign nations". The communique concludes by saying that as foreign forces leave Afghanistan a "decade of transformation" should begin "in which Afghanistan consolidates its sovereignty". It says the international community's vision for Afghanistan is of a "stable and functioning democracy... conducive to prosperity and peace". However, correspondents say that behind the optimistic diplomatic language, Afghanistan faces immense challenges - the country will be dependent on billions of dollars of foreign aid for years to come and the absence of Pakistan or representatives from the Taliban has cast a shadow over the summit. Earlier, Afghan President Hamid Karzai hailed the progress his country had made but warned that such gains were by no means secure. "The people of Afghanistan are looking to this conference for clear affirmation of commitment to make security transition and economic progress irreversible," he said. About 1,000 delegates from 100 countries and international organisations took part in Monday's gathering. German Foreign Minister Guido Westerwelle, as host of the conference, said: "We send a clear message to the people of Afghanistan: we will not leave you alone, you will not be abandoned." US Secretary of State Hillary Clinton said she thought it "unfortunate" that Pakistan was not attending. "We continue to believe that Pakistan has a crucial role to play," she told reporters on the sideline of the meeting. Mrs Clinton also said that Washington was ending a freeze on hundreds of millions of dollars in development funds to Kabul, following financial reforms there. Afghan and US officials have repeatedly said that militant groups operating in Afghanistan are based in Pakistan - a charge Pakistan denies. Nato apologised for the air strike on 26 November but Pakistan insisted it would not attend the talks. Efforts to hold talks with the Taliban have brought no tangible result so far. In September militants assassinated former President Burhanuddin Rabbani, who was leading Kabul's effort to broker peace with the insurgents. Correspondents say a failure to bring the Taliban into the peace process will make it harder to secure the long-term commitments needed to rebuild Afghanistan when Nato operations end in 2014.